On the Log In page you will be prompted for a Username and Password. The Username and Password you use to access your GridWay Hosted E-mail, via Outlook, or Web-Mail access is the same Username and Password to be used when accessing the CanIt SPAM Filter. So, if your company’s Internet Domain name is: widgets.com, and you log in to your Outlook E-mail as: john.smith@widgets.com, this is the Username you would use on the CanIt system: john.smith@widgets.com. 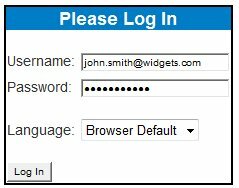 Even if you have an E-Mail alias of jsmith@widgets.com (that a messages has been Trapped for) you would still log in with your real Outlook Username:john.smith@widgets.com.